Each week, nervous Dog Moms and Dog Dads contact me, wondering how we dogs do after amputation. They want to know what the post-op procedures are like, and how dogs handle chemotherapy. And while all dogs respond a little differently to all of this, most of us bounce back right away! Kiva is one of my new tripawd friends, and she is recovering nicely after losing her front right leg. What a great Christmas present; the gift of a pain-free life, and another chance at being a healthy, happy dog! Her Mom Jolene has graciously allowed us to share her account of the first few days after Kiva’s surgery. 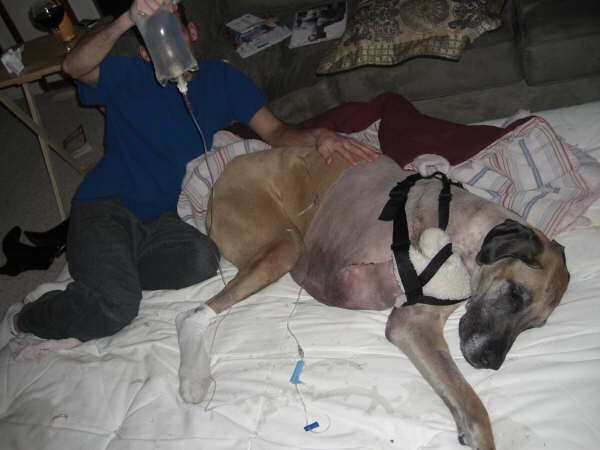 We hope this gives you a small picture of what it’s like to bring a dog home after surgery, and what to expect if you’re participating in chemotherapy. Kiva’s Mom says that if you want to chat about her experience with amputation and chemo, please post your questions here and she will do her best to answer them. Kiva had a bit of a hard time following her surgery. The amputation itself went just fine. She got up for the first time all on her own and she dragged the vet student down the hallway when they went to go outside for the first time. When I got her home she pretty much cried for two days and nights straight. It broke my heart to think she was in so much pain. I had a bit of a freak out moment wondering what I did to her. I had to keep telling myself it was the best thing for her and that she was no longer in pain. The morning after we got her home it snowed and we had freezing rain. Kiva had a hard enough time learning to go to the bathroom on three legs. Now she had to try and go in 6 inches of snow and ice. It did not work so well. She went about 30 hours without going to the bathroom…at all! I finally called the emergency vet service on Sunday morning and they asked me to bring her in for an overnight stay. So I just got her home on Friday and I had to take her back on Sunday. They gave her a catheter to drain the bladder and culture the urine. She was severely dehydrated but everything else was normal. Basically, there was no physical reason why she shouldn’t go to the bathroom. So they sent us home with a pep talk and enough IV bags for a week. I give her 2 – 1000mL bags a day with the needle and IV drip to keep her hydrated. Now, she is going to the bathroom on a regular basis (even though we have had at least another 6 inches of snow) and she seems much more comfortable. She only needs help walking when we are outside in the snow and when she first gets up in the morning. She has cuts on two of her remaining feet from hopping on the ice, one she got when she was at the vet office and one she got at home. So for awhile she is limping AND trying to adjust to having three legs! Poor baby!! I finally feel like she is adjusting to the amputation. She seems happier and more comfortable and I continue to do research to keep my mind in the positive. For at least a few days I had all kinds of second guesses. When she was crying all night long or when she struggled to go to the bathroom or when she was hopping around in the snow or when I got frustrated and was less than patient with her or about a hundred times a day when I looked at her and felt bad. However, I know I did the right thing. When I think of the alternative there is no question that I could have done anything else. It has just been me and her for the last five years and I want her to be around for as long as possible! Kiva received her first round of chemotherapy, Carboplatin, on Thursday. It is now Sunday and she doesn’t seem to be affected much. She seems a little more tired then usual but that’s it. If she does have adverse affects from the chemo I think they would really start today. Next week she gets her first round of the clinical trial drug, Pamidronate. This is a drug that would be used in humans to treat osteoporosis. It travels through the blood stream and looks for areas of bone weakness and attaches to it to help it stay strong. It is also done with an IV but takes 2 hours to administer instead of the 10 minutes it takes to give the Carboplatin. Chemotherapy every 3 weeks for four rounds. The first four rounds of the Pamidronate will be administered one week after each round of Carboplatin. The next four rounds of Pamidronate will be administered every 2 months. Blood work is done with every visit and she receives 7 Thoracic Radiographs throughout the process to determine if the cancer is spreading. Wow, putting in writing really makes it seem real. It seems to be a lot of poking and prodding and needles and time away from me. Another thing that really surprised me and should be thought about if participating in a clinical trial is the fact that they have the right to autopsy her body when she dies. I was completely taken aback when I was asked to sign the consent form saying I would make every opportunity to get her body there for autopsy. When I think about it now, it makes sense that this would be a part of the deal. How else are they going to get really good information if the drug is working. But, it never crossed my mind and it really got to me. I think it’s important for people to know this ahead of time so they don’t have to hear about it for the first time while signing the consent papers. I don’t know why this is getting to me so much. I don’t know what other plans I had for her after she passes. I’m certainly not going to dig a hole for a 145lb dog in my backyard. I don’t know I think I have to think about this some more. I have also chosen to send a sample of her blood to another research project involving dogs and osteosarcoma. The University of Michigan and the Massachusetts Institute of Technology are looking for potential genetic risk factors for bone cancer in dogs. The research group is also starting studies for other illnesses in dogs. It is called the Dog Genome Project. I emailed one of the doctors and she send me a blood collection kit that I gave to my vet and they mailed it out. Along with the blood and the consent form, owners also have to send the diagnosis from the lab and have at least a three generation pedigree and be registered with the AKC. I’m assuming this is how they are going to find those genetic links. Money was another thing that has really surprised me. It is costing much more then what I found when I researched. I am sure that is because of her size, but wow! It’s a good thing I have been working full time for 7 years and have no husband or kids. I have just enough money saved up to take care of things. Tripawd Tuesday: Celebrating Cotee the Senior Tripawd! Bawk! Bawk! I Bark for Chickens. My dog snow is two days out from her amputation .it is so sad she is trying to go down stairs but gets very scared . How can I help her . She is having a hard time walking does this get better.she is a white great dane I would do anything for her but it’s breaking my heart.Is there light at the need of the tunnel for her. Lynn, please come to our Discussion Forums where the entire community can help you. Yes, it does get better. Two days is not a long time. Come over and let us help you and Snow OK? See you there! My 7 year old great dane Barbee was just diagnosed with bone cancer by her vet. We meet with the specialists at our local University later this week, but I am already trying to wrap my mind around my optoins. Our vet said she wouldn’t do well with amputation becuase large dogs do not, it tears up their other leg, and that the cancer could be everywhere. But, I hate to put her trough an amputation to just have her suffer worse. I am so torn, and want to do what will give her the best life. Any suggestions or help would be appreciated! Gabrielle, please join us in our Discussion Forums where you will find LOTS of help from other giant breed folks who understand what you’re going through. I’m not a vet but I can tell you with 100 pawcent certainty that MANY giant breed dogs do GREAT on three legs, just look around our blogs and in our Forums and you’ll see. 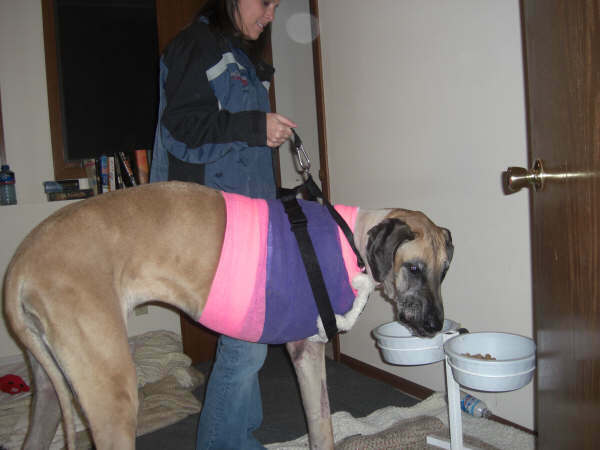 In fact, Tripawds was founded because we saw a video of a Dane named Moose, who lost his front leg to osteosarcoma and went on to live a fabulous life for two years after surgery! Although amputation isn’t right for every dog there are many out there who do very well. Please visit us in the forums where we can help you a lot more OK? This is our 8.5 year old girl Zoe. We felt all of the apprehension and doubt as you all did. Zoe did not cry at all and we were blessed to have our vet here in Spain come to our home every day. Luckily we have had insurance for her since we first got her and boy has it been worth it. 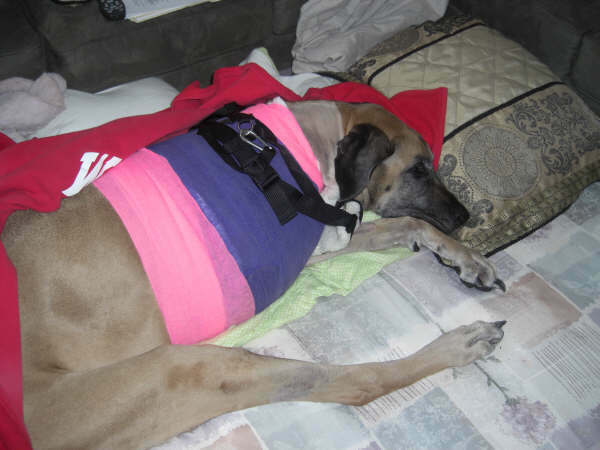 As not only did Zoe have osteosarcoma but also histiocytoma which is a benign skin tumor. She was cancer free for 4 years after the histiocytoma the osteosarcoma started about 6 months ago in her left front leg. 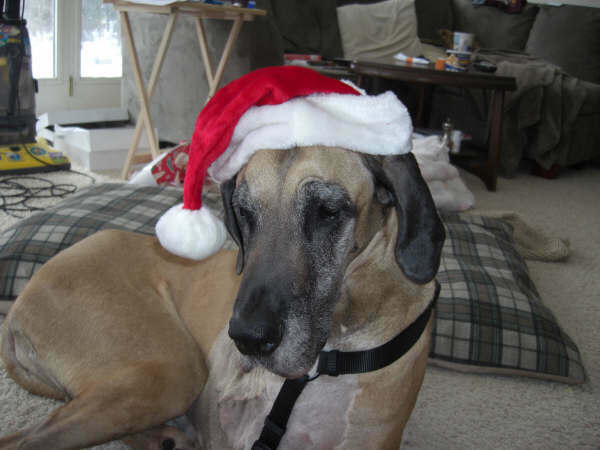 My Great Dane “Dixie” was diagonsed with Osteosarcoma in June of 2010. After consults with several cancer specialists, I/we (the Dr’s) decided she was a candidate for amputation. It was her front leg. She was 5 1/2 years old. Surgery was in July 2010. She was given 6 months to live after surgery without chemo. I could not afford Chemo, I was unemployed at the time and took out a personal loan to have the surgery, about $7000. The first couple of months were bad. She wimpered and cried all the time. The bandage was too tight at first and the adema was really bad. They loosened the bandage and it subsided and she was more comfortable. She wouldn’t eat and then got dirahea really bad. The pain meds they put her on did not ease her pain. Finally a Vet figured out it was ampute sydrome of phantom pain. We put her on Gabapentin (spelling?) finally the break through I was waiting for. They told me the next place the cancer would show up was in her lungs. I have had her X-rayed every 6 months since her surgery. I am happy to say she will turn 7 this Dec 2012 and she is going strong. Would I do it again, don’t know, depends on the “quality of life” and the dog. I would give my life for my dogs. God bless them all. Sarah, what an inspawrational story, thank you so much for sharing! Dixie is a miracle girl, it must be a Dane thing. Did you know about Nova the Tripawd? She is going on FOUR YEARS post osteo diagnosis, despite the odds. We call her The Queen around here, and now, Dixie can join her royal court! 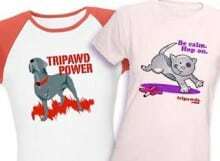 Welcome to Tripawds, we hope you visit our forums and share more about your amazing girl. Thanks for the comment Holly, we’re sorry to hear about Olie but glad you found us. Post in the forums or search the blogs and you will find plenty of success stories about dogs of all sizes loving life on three legs. This community recently lost Nova, a blind three legged Great Dane who survived osteosarcoma for more than 4 1/2 years after her amputation. Check out our reading list for lots of helpful links, or consider downloading the Tripawds e-book for immediate answers to most common questions. K9 Immunity drug, and if so what are your thoughts on it? Spend some time in the Tripawd Discussion Forums and you’ll feel much better. There are plenty of posts about K9-Immunity, and other supplements. You will also find lots of large breed dogs who are doing just fine on three legs … just look at Tazzie! A harness will help your dog on stairs. Sadly, Kiva has passed, but you will find many other success stories of large three legged dogs in the forums. Was reading your story about Kiva (hope she is doing well), and I was wondering if you have heard of the K9 Immunity drug, and if so what are your thoughts on it? I just found out that my 5 1/2 year old dane has bone cancer. Well, my vet said she is 90% sure from the x-rays. We had her do a biopsy and send it off so we can be 100% sure. This is really rough for me because I lost my other dane at this same time last year and she was also only 5 1/2 years old. Nikita (the dane I lost last year) had many problems throughout here life ( HOD, IMHA, BLOAT, tore her ACL and had to get a double pin system put in, and so on). So I am struggling both emotionally and financially (since I spent enough on my other dane to buy a new car) with what to do this time. I have been researching online a little and came across the k9 immunity. It sounds like something that might be good for your dog after you are done with chemo. You might want to do a search online and check it out. And if you have heard of it, any input would be greatly appreciated. Honestly though, with the personality of the dane I have I don’t think she would do well with 3 legs…any change freaks her out, and she hates the vets and has to be muzzled when she is there so I am not sure that spending that much time there would be a good choice for her. Then there is the whole quality of life issue. Maybe it is just better if she enjoys what life she has left instead of spending it at the vets, etc. I was just hoping that maybe the k9 immunity could help her live a little longer. I know these are questions we all struggle with. And it drains us emotionally. I, like many, consider my dogs like children (and I do not have children). But I want to do what is best for her….I’m just not sure what that is. Thanks for listening! Riley: Please check out the Tripawd Forums for lots of discussion about osteosarcoma in large breed dogs and how well they can cope on three legs. And please remember; it’s all about quality of life, not quantity. Yes, cost is a concern of course. But you must decide what it’s worth to you. A heart-wrenching decision, we know. 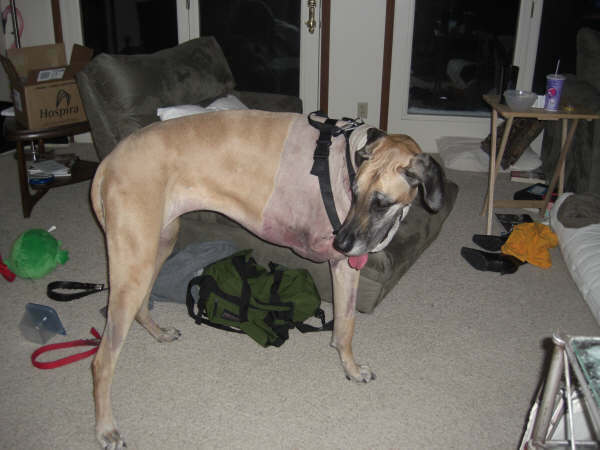 I have a great dane who just was diagnosed with osteosarcoma of his right front leg. He turned 7 in June. He weighs 174 pounds. I find it hard to make a decision financially and am worried about his quality of life since a great dane’s life expectancy is only 8. I love my Riley but am very indecisive about this. I would appreciate any thoughts you have. Hi there, my name is Jamie and I have a 6 1/2 year old great dane named Ripken. We have just been diagnosed with bone cancer. After doing a lot of research I too am making the decision to amputate. It relieves me to read your story and thank you so much for sharing it. I’ve been struggling with making this choice but I too can not bear to see my love in pain and just sit and do nothing. He has been my best friend, the love of my life. My vet discouraged me at first telling me large breeds do not do well with amputations, especially front leg amputation. This was not an answer I could accept so I’ve been looking for people who have gone through it and know first hand. Thank you for putting my heart at ease. I know it’s going to be a rough road but I’m all in. I’m very interested on how Kiva’s doing. If you have the time could you let me know? I also have some concerns about stairs, I live in a two story home and moving is not really an option. Kiva is a beautiful girl who’s lucky to have a mom that loves her so much! Thanks again, after reading a lot of stories Kiva’s has been the most helpful. » We're at a loss for what to do.